"Monstrous little Women" is a live video performance, in which female stereotypes in horror films are being explored. A common thread connecting the different films, is how evil is being present in the women as something unstable and hysterical. It is though the unstable feminine nature "evil forces" can harness and exist. The evil feminine subject in horror films, is being explored through samples taken from a selection of horror movies from the 1950`s until today. The VJ panel is programmed in studio max, making a live three channel video projection. Audio and video samples are being scratched and re-sampled to soundtracks from the album "Syklubb fra hælvete". This album was the first release made by Fe-mail, a noise duo consisting of Maja Ratkje and Hild Sofie Tafjord. 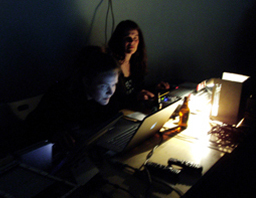 The performance has been produced with the support from Office of Contemporary Art, Oslo. Programming of VJ system by Torolf Thuestad at Bergen Center of Electronic Art. Eirik Jørstad, Frank Teksum, Alessandra Pioselli, Maja Ratkje, Hild Sofie Tafjord and Bergen Center of Electronic Art.